Tindaloo in CyberSpace: Charlotte & Rudolf the reindeer! Charlotte & Rudolf the reindeer! Papirplanetens utfordring for Desember er 'Alt er lov med JUL', og jeg har laget en koselig julekort med et av mine favoritt stempler, som mitt DT-bidrag ~ Charlotte is riding Rudolf fra Whiff of Joy, som du kan finne her :) Og gavelappen og snøkrystallene jeg har varme-embosset er fra et stempelsett fra Staz som heter 'Oldemors Pepperkaker'. My jolly christmas card for today is decembers DT inspiration for PapirPlaneten, an norwegian challengeblog and craft shoppe ♥ The theme is all about christmas and my supercute motiv is one of my absolute favourite stamps from Whiff of Joy :) Below is a gift tag I will use with it, by the norwegian stampcompany Staz. Stamps/Images: Whiff of Joy 'Charlotte is riding Rudolf'. Scrappers Choice CS 'God Jul journaling'. Kort og Godt 'M-130'. Staz 'Oldemors Pepperkaker'. Panduro 'God Jul' stempelsett. Papers: Bazzill cardstock. Plain white cardstock. Panduro Hobby 6x6 'Way back when' & 'Vintage jul' papers. Embellishments/Tools: Spellbinders™ Nestabilities 'Lacey Ovals S4-314', 'Labels One s4161' and Grand Dies 'Labels One'. Embossingfolder from a magazine with snowcrystals '...'. Joanna Sheen Signature dies 'Set of 5 Narrow Edger Dies'. Marianne Design Folder/Dies 'DF3413 Hearts'. Marvy Uchida punch 'corner rounder small 1'. Gold washi tape unknown. Techniques: I always use my Scor-Pal to score n fold my cards. I prefer Canson Montvale aquarelle paper (200 g/m coldpressed). My distress tools from Ranger Ink is always in use! ~ Tim Holtz® Mini Ink Round Blending Tool & the Inkssentials Ink Blending Tool and Foams. I used misc. Tim Holtz Distress Ink pads to watercolor and distress image and papers. I've heat embossed with Ranger clear embossingpowder. Glossy accents. Takk for at du er med og scrapper med oss i Kreativ Scrapping. Takk for at du deltek i Papirlosjen si utfordring. 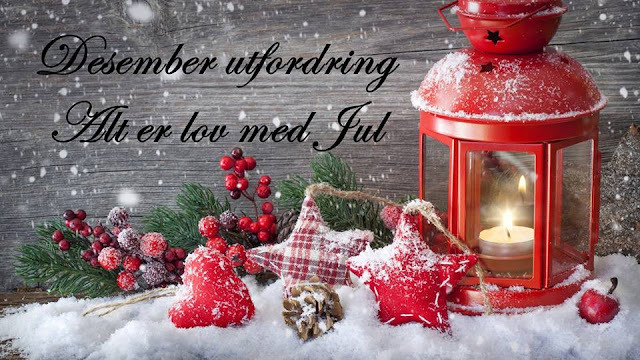 Tusen takk for at du deltar på jul/vinter utfordringen hos Papirlosjen! Merry Christmas ♥ CF Blogcandy!